Small, family-run Gasthof Innerfraganter Wirt is located in the center of the Flattach Innerfragant closer to the glacier, about 5km from the center. The apartment house is located in MENTIL in center of Flattach at Glacier Mölltal Spothotela Mölltal next section Kleindorf. Nearby there is a supermarket, restaurant, pub, pizzeria, coffee. Favorite informal sporthotel Mölltal is located in Flattach part Kleindorf, about 100m from the shops near the pizzeria, bar. It consists of main and secondary buildings (50m apart). Spittal railway station 40 km, 115 km Klagenfurt airport. Favorite Sporthotel Mölltal with an informal atmosphere situated in the center of Flattach, about 100m from the shops. It consists of main and secondary buildings (50m apart). Spittal railway station 40 km, 115 km from Klagenfurt airport. Hotel Flattacherhof is located in a quiet location in the center Flattach. Mallnitz Railway Station about 12km. Altitude 699 m center. Glacier skiing ski season extends from December to May, the longest cableway in the Alps for 8min to get up to 3122 meters, where you will be surprised by 53 km perfectly prepared ski trails and spectacular views. 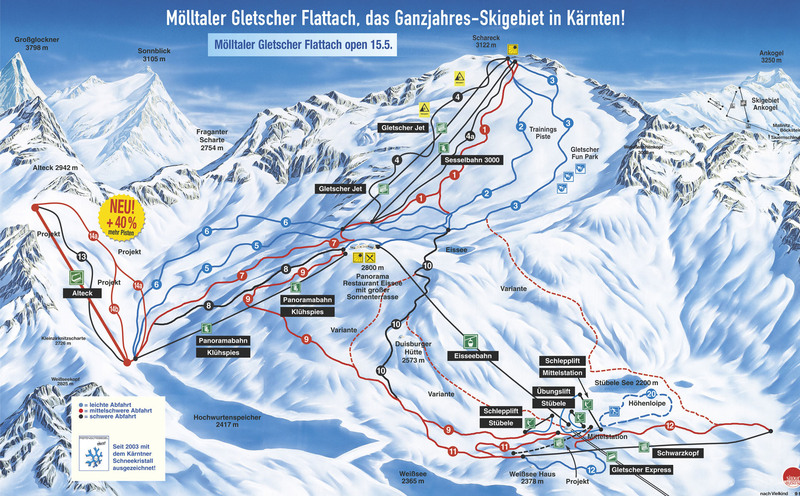 The resort is accessible from the town Flattach, or from a nearby Mallnitz. The apartment house Sissi has a total of 7 apartments, situated in a quiet location in the district Flattach - Ausserfragant. The friendly, family-run hotel Fraganter Wirt is located under Moelltal glacier on the south side of the Hohen Tauern in Flattach center, in the heart of Ausserfragant, about 15km from the train station. Blumenmosaik recently built apartments are located in the resort Flattach in the central part Kleindor, supermarket, bank, post office, restaurant nearby. Recently built apartment house Gletscherblick is located in the resort Flattach in the center of Kleindorf. At the apartments is a supermarket, cafe, restaurant, sport shop with ski rental and service. Pension Striednig is located in the famous ski resort Molltal with hail Flattach in the center of the village, about 10 minutes walk from a supermarket, bank, newsagent and restaurants. The family-run Alpenhof hotel is located right in the center Obervellach. It consists of two buildings, accessory building is 20 meters away from the main building. Altitude resort 680 m. Mallnitz Railway Station 8 km, 110 km Klagenfurt airport.